Ask fellow campers about "G & R Campground" and nearby attractions. It's a very nice quite park. We came in for the State Fair had a great time even with all the rain. The sites are almost perfect I backed in and it was level. We camped at G & R Campground in a Travel Trailer. The owner at the office was over and beyond helpful. The park was clean and completely secluded. Beautiful wooded park. We camped at G & R Campground in a Motorhome. Great owners, very friendly and helpful, guided us to our site. We chose a water and electric only site since we were staying only 1 night. Campground was neat and clean. We did not use any of the facilities so cannot comment on them. Wi-Fi is only available near the office/activity center and would not reach our site. No problem with the interior roads and we drive a 40' motorhome. 13 OTA TV stations available. We would return if in this area. We camped at G & R Campground in a Motorhome. We had SO much fun here!!! My nephew's wedding was this weekend. There was to be an outside reception elsewhere, but it rained. Last minute we reserved the activity center here and the staff at G & R went above and beyond for us. Everything was perfect! We had already reserved 8 of the cottages and were thrilled that they were so much like staying in a hotel (minus room service), but still, all we had to do was call for whatever we needed and it was promptly delivered...whether it be firewood or toilet paper. We cannot wait for the chance to come back...in fact, the bride & groom already went back and stayed in a cottage over Memorial Day! We ALL loved our weekend at G & R!!! Thank you, guys!! We camped at G & R Campground in a Cabin. Very tight turns, very friendly check-in, he actually led us to our site with his vehicle. I would stay here again. It was a little damp and muddy, granted it was a crummy day but with more grass, it would have been better. We camped at G & R Campground in a Fifth Wheel. This park is easy to get to but the roads are a bit tight with lots of turns and trees but we did it in our 40' motorhome. The back-in grass sites are well shaded and a little small but have enough room for slides and awnings. There is no Wi-Fi and no cable and we couldn't pickup any OTA channels. Our Verizon signal was weak and would drop calls at times. Even with these drawbacks we liked this campground and would return. We camped at G & R Campground in a Motorhome. It had been raining all day when we pulled in. Our water/electric site was sand and gravel, with no standing water, and very level. We were surrounded by trees, and at this time of year didn't have any close neighbors, although the sites in our area (site 7) were close together. The bathrooms were old and worn, but clean. However, the only ventilation was an open window. This was a good place to stop for the night, but not a place we would stay longer. We camped at G & R Campground in a Motorhome. Gravel interior roads lead to gravel level sites with a lot of shade. Facilities were worn and unattractive. Basic utilities were good but there was no cable or wi-fi. The park was not heavily occupied and most of the occupants were seasonal or permanent. Some activities were available in the form of a basketball court, pool (closed) and pavilion. Both residents and staff were friendly. We camped at G & R Campground in a Fifth Wheel. Restrooms and showers old and not so nice at first glance but at least cleaned daily. Regular sites are wooded so no satellite. We opted for the field and thus no sewer, but they still charged $35. Pool is nice. Other than that, there is nothing remotely special about this place. Basically this place is for weekend campers, not full-timers looking for a nicer place. We camped at G & R Campground in a Motorhome. 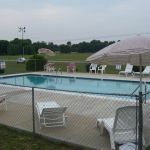 We were happy to locate this park which is open all year and very close (about 6 miles) from Harrington Casino, also about 20 minutes from Dover Downs. Very friendly and welcoming staff. The owner led us to our site #48. Simple but clean rest rooms with showers, heated by an in-wall propane heater, cool but not cold in late December. Both 30 and 50 amp sites available. Plenty of trees and fallen leaves on the ground. Sites and road are graveled. Our site #48 reasonably level. The office is not always staffed, call and leave message with approximate time of arrival and someone will get back to you and can meet you when you arrive. We opted to stay an extra day and simply put our daily fee in the mail slot by the front door to the office as the manager directed. You are in the country here but not far from an excellent large diner (Rudy's) at the junction of Routes 14 and 13, and there is a Food Lion supermarket in the same area. About 20 seasonal rigs were at the park for the winter, mostly tagalongs and 5th wheels. Most owners are working on a contract basis in the local area and seemed quite friendly. Only one other transient rig at the time we were there. Location is perfect if you like the casino. We will definitely return. We camped at G & R Campground in a Motorhome. We camped here with our Club for the weekend and we all went to the Punkin Chunkin, which was located about 15 miles from the campground. The campground was very clean and everything was well organized at check-in. The owners and staff are the nicest you will ever find. 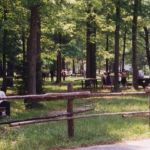 The sites were plenty large enough with picnic tables and fire rings. Our site only had 30amp service while my neighbors had 50amp, they did pay a little more, however I didn't really need 50amp in the winter and saved $10.00. I would have rated this campground higher if it would have had cable and Wi-Fi. I also couldn't receive any satellite signal because we were parked in the trees. Everyone in our club was very impressed and happy with this campground. We camped at G & R Campground in a Fifth Wheel. The price was due to NASCAR race in Dover. We elected to stay in the large open area by the CG entrance to avoid the trees and race fans. There is both 30amp and 50amp power in this area along with water but no sewer which is fine for a couple nights. The rooftop dish worked fine. Sprint cell and internet access was OK but slow. Staff was quite friendly and even brought us a picnic table. We camped at G & R Campground in a Fifth Wheel. We stayed only one night while in transit, but this seemed like a pretty reasonable place. Satellite access was excellent. We would probably stay again. We camped at G & R Campground in a Fifth Wheel. Nice Campground, friendly staff, easily got around in our 40' motorhome. Great campground to go to Pumpkin Chunkin. Campground was clean and very spacious. We will return next year for the chunk! Pumpkins are for carvin, punkins are for chunkin We camped at G & R Campground in a Motorhome. Are you affiliated with G & R Campground ?